The planned LSU Military Museum is seeking memorabilia and artifacts from LSU alumni or family members of deceased alumni who served in the United States armed forces. The university, in partnership with Cadets of the Ole War Skule, is finalizing plans for a campaign to raise funds to renovate Memorial Tower to house the LSU Military Museum and for an endowment for military scholarships for ROTC cadets. 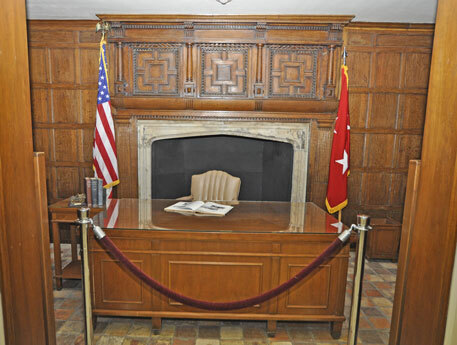 The museum will be the repository for items reflecting the university’s military history and heritage from Gen. William Tecumseh Sherman to Gen. Troy H. Middleton, whose collection will be the focal point of the permanent collection. Plans include exhibitions and collections related to the history of ROTC at LSU; involvement of LSU faculty, staff and students in America’s wars and conflicts; LSU’s military leaders; and Cadets of the Ole War Skule. Memorabilia will be accepted beginning in September and continuing on selected dates thereafter. Requested items include but are not limited to uniforms and other clothing, trunks, luggage, maps, books, battle plans, photos, correspondence, plaques, medals, citations, flags, cameras and typewriters. 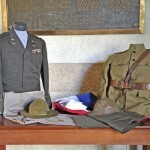 Until further notice, donations of memorabilia for the planned LSU Military Museum will be taken by appointment only. In January of 2012, regular days and times of collection will be re-established. The university, in partnership with Cadets of the Ole War Skule, is seeking memorabilia and artifacts from LSU alumni or family members of deceased alumni who served in the United States armed forces. To arrange a date and time for the donation, contact Cadets of the Ole War Skule at 225-578-0420 or cadets@lsu.edu. Museum donation form download link. Adobe Acrobat® Reader 3.0 or higher is required to view and print PDF files. Download link for Acrobat Reader. 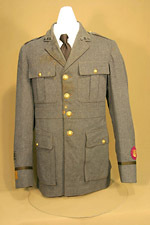 ROTC cadet uniform jacket worn by Gustave “Gus” Genin Quinn, Class of 1927, Civil Engineering, who moved with LSU from its old campus near the site of the State Capitol to the Pentagon Barracks on the present campus in 1926. Photo by Larry Hubbard, courtesy LSU Textile & Costume Museum. Click on image for a larger view. Memorial Tower and LSU War Memorial on the Parade Ground. Photo courtesy, LSU Office of Communications & University Relations. Click on image for a larger view. 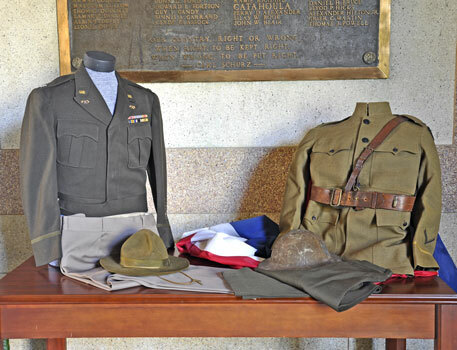 World War II, left, and World War I uniforms donated to LSU Army ROTC by Peggy Kilgore. The uniforms belonged to her father-in-law, Leonard Kilgore Sr., who served in the World War I as a 17 year old and volunteered for service in World War II. He earned a master’s degree from LSU in 1927. Photo by Ray Dry. Click on image for a larger view. 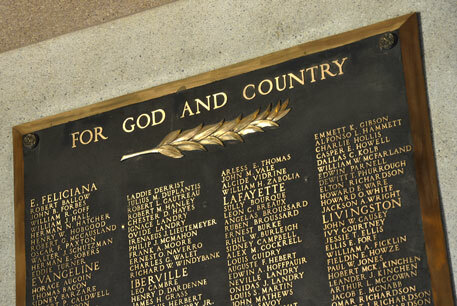 The names inscribed on the bronze plaques in the rotunda of Memorial Tower are those of Louisiana citizens who made the ultimate sacrifice for freedom in World War I. Photo by Ray Dry. Click on image for a larger view. 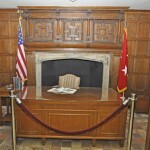 The desk used by Gen. Troy H. Middleton, who served as president of LSU from 1951-1962.Photo by Ray Dry. Click on image for a larger view. LSU opened its doors on January 2, 1860, in Pineville, La., as the Louisiana State Seminary of Learning and Military Academy. Thus began LSU’s long and proud military tradition. 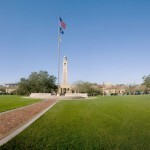 Memorial Tower, also known as the Campanile, was built in 1923 and dedicated in 1926 and was one of the first structures on LSU’s present campus. 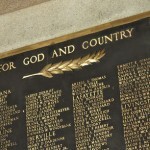 Financed and constructed through the efforts of American Legion posts throughout Louisiana, Memorial Tower was donated to LSU as a memorial to those who died in service to the nation during World War I. Inscribed on plaques in its rotunda are the names of Louisiana citizens who made the ultimate sacrifice for freedom. 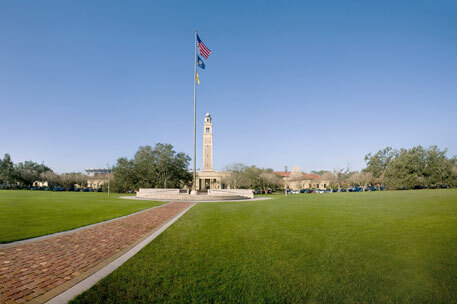 Long the symbol of LSU, Memorial Tower was, for many years, home to the University’s War Museum and “welcome center” and until 2005 housed the LSU Museum of Art. To carry on LSU’s 150 year-old military tradition of “the Long Purple Line,” the university – in partnership with Cadets of the Ole War Skule – is finalizing plans for a campaign to raise funds to renovate Memorial Tower to house the LSU Military Museum, or LSUMM, and to fund an endowment for military scholarships for ROTC cadets. The museum will be the repository for artifacts and memorabilia reflecting the University’s rich military history and heritage from, General William Tecumseh Sherman to General Troy H. Middleton, former president of LSU, whose collection will be the centerpiece of the museum’s permanent collection. Plans include exhibitions and collections related to the history of ROTC at LSU, involvement of LSU faculty, staff, and students in America’s wars and conflicts, the university’s military leaders and Cadets of the Ole War Skule. One wing will be devoted primarily to permanent exhibits, and the other wing will house rotating exhibits which will change on a scheduled basis. Supporters making capital donations to the upcoming endowment campaign will be able to choose from a unique selection of naming opportunities for scholarships, galleries, exhibit rooms, walls of honor, interactive computer kiosks, sponsorship of permanent and temporary exhibitions, the library and offices. Memorabilia will be processed, tagged and stored in a local climate-controlled storage facility for processing and preparation for the opening exhibition. In Memoriam – O. Fred Loy, Jr. In Memoriam – John Landry “Boodie” Boudreaux, Jr. Copyright © 2019 Cadets of the Ole War Skule. Powered by WordPress. Theme: Spacious by ThemeGrill.